A veteran of stage, screen, television and radio, Richard Basehart has long been considered by his colleagues to be an "actor's actor." The 5'9" strawberry blond was born John Richard Basehart in Zanesville, Ohio in 1914. With a desire to follow in his father's footsteps, Basehart decided he, too, would become a newspaper reporter. Barely out of high school, the cub reporter uncovered a scandal going on a City Hall that ended up toppling the administration! The story cost him his job as well - the young Basehart punched a detective in the face and was fired from the paper. Having already tried his hand at acting at the tender age of 13, Basehart settled on the idea of a return to the stage, and thus, a magnificent career was born. At Philadelphia's famous Hedgerow Theatre, Basehart played 40 different roles in 5 years - from Shakespeare to Saroyan. The Great White Way beckoned, and Basehart very quickly made his presence felt with a role in producer Margaret Webster's "Counterrattack". In 1945, his powerful and seemingly authentic portrayal of a Scotsman in "The Hasty Heart" earned Basehart the New York Critics' Award as the most promising newcomer of the year. Hollywood came calling next. 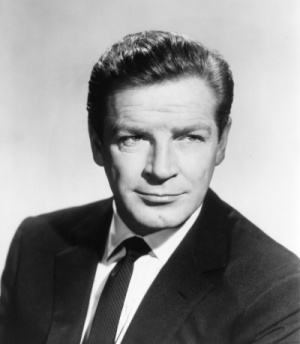 Richard Basehart made his screen debut in "Cry Wolf" with Errol Flynn and Barbara Stanwyck. Basehart's haunting performance in "He Walked By Night" won him a contract with Twentieth Century-Fox. Eventually, Richard Basehart became an international star. Although he has appeared in everything from "La Strada" to "Columbo", and has used his rich, sonorous voice to narrate countless documentaries, Richard Basehart is perhaps best remembered for his portrayal of Admiral Harriman Nelson in "Voyage to the Bottom of the Sea". When "Voyage" went off the air, Basehart continued to act in movies, television, and plays. Despite his busy career, Basehart found time for charitable work as well. In 1971, with his wife Diana, Richard founded "Actors and Others For Animals" - a non-profit organization dedicated to the prevention of cruelty to animals. His last job was as narrator of the closing ceremonies of the 1984 Olympic Games in Los Angeles. Suffering a stroke, Richard Basehart passed away shortly thereafter.